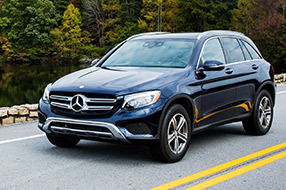 For 2016 or newer models, Mercedes-Benz mbrace unlocks your vehicle's potential. Similar services are also offered via mbrace for 2013-2015 models. Mercedes-Benz mbrace is a collection of services and features - available in four distinct packages - that makes your ownership experience smarter, safer, more convenient and more fun than ever before. Enjoy the base package, mbrace® Connect, standard for five years with any new Mercedes-Benz. Start your vehicle from anywhere, and if climate controls were on, they will automatically heat or cool to your last setting. 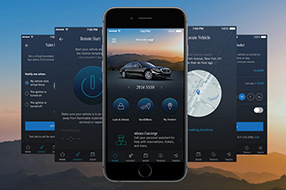 Lock or unlock your vehicle from virtually any location with the Mercedes me app on your iOS or Android smartphone. You can also do this with a phone call to the mbrace Response Center (operator assistance requires the mbrace® Secure package). Help locate your car in a crowded lot, or call attention to it in an emergency, by remotely sounding the horn and flashing the exterior lights for a period of five seconds. This feature is accessible through the Mercedes me app. 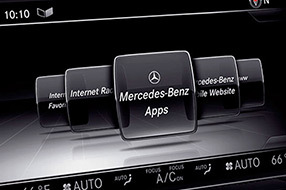 Lets you send an address from the Mercedes me app on your phone directly to the COMAND navigation system in your car. When you get to your car, you can start navigating right away, or save the address in the system’s memory. View your car’s location on a map on your smartphone, if you’ve forgotten where you parked or want to monitor your vehicle. If your Mercedes-Benz needs a jump start, its spare tire installed, or if you have any other vehicle trouble, one button puts you in touch with our legendary Roadside Assistance. Even before your conversation begins, the vehicle transmits its GPS-based location and information about its model and color to the Roadside agent. Easily contact your preferred dealer, or receive assistance in finding one that’s nearby, with the push of a button in your car or via the Mercedes me app. A live assistant can not only look up the dealer for you, but also place the call to connect you to the desired department. Monitor use of your vehicle by receiving alerts when your vehicle has been started during a specified time or date. Receive text alerts if the vehicle exceeds a speed that you select and set up on the Mercedes me app. See where your Mercedes-Benz has been driven using an online map with a “breadcrumb” trail of its recent locations. View your electric or plug-in hybrid vehicle’s charge status, map its driving range, locate charging stations, preheat or cool the cabin, and more, all from your computer or smartphone via the Chrome™ and Safari® Web browsers. Wherever you’re headed, Local Search provided by HERE can help you get there quickly and easily. You can save search results, call listed phone numbers, and start navigating with just a few clicks. Search actual user reviews of restaurants and businesses with Yelp, and navigate directly to the destination of your choice. Keep up-to-date on the latest online news from around the world. You can even share news stories via email. Using the Send2Benz feature on Mercedes me, it’s easy to find a Point of Interest and send its address to your vehicle’s navigation system. When you’re ready to go, you can start your route guidance based on your vehicle’s current location with just a few clicks. Courtesy of Mercedes-Benz Financial Services, you can now look up your account details, make a payment, contact a dealership and more from the driver’s seat. Receive global market data, search among more than 400,000 investment offerings, and create a personalized Watch List for financial updates. Your dealer can remotely retrieve diagnostic vehicle data in order to determine what kind of service your vehicle needs, potentially saving you an extra visit for a preliminary diagnosis and saving you time spent in the dealership when it’s time to have the service done. With mbrace Secure, if an air bag or seat-belt Emergency Tensioning Device is activated, your Mercedes-Benz can automatically place a call to the mbrace Emergency Response Center, including reporting your location, even if you can’t. 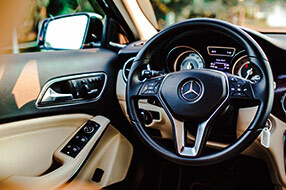 The GPS system that’s built into your Mercedes-Benz can assist authorities with stolen vehicle recovery. Once you file a police report, a phone call to mbrace offers a safe and effective way to help the police locate and recover your car. Lock or unlock your vehicle from virtually any location with a few taps on your smartphone. Or if you’ve locked your smartphone in the vehicle, borrow a phone to call the mbrace Response Center, and an agent can unlock it for you. Your vehicle’s factory-installed antitheft alarm system can send you an alert via email, text message or phone, whichever is your preference, if the alarm is triggered while the vehicle is parked. Easily contact your preferred dealer, or receive assistance in finding one that’s nearby. With the push of a button in your car, a friendly mbrace operator can not only look up the dealer for you, but also route your call directly to the desired department. From setting the clock to understanding an indicator light, you can connect to a trained product specialist with the push of a button in your car or using the Mercedes me app, anytime you have a question about your car and its features. Enjoy virtually unlimited assistance from a helpful agent with knowledge and resources to aid with almost any request. 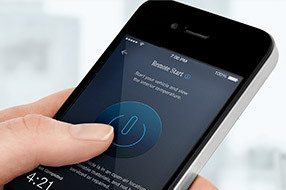 Contact an expert Concierge when you’re on the road, or from the Mercedes me app on your smartphone. Get expert recommendations and reservations for travel and dining out, tickets to events, and answers to almost any question. Plan your routes on-the-go with the touch of a button. A specialist will help you select a point of interest (POI) from over 15 million POIs and then send the address to your vehicle’s navigation system. Then you can access directions based on your vehicle’s current location. Hear up-to-date voice-delivered traffic information in your car, based on your current vicinity or along preferred routes that you set up online (up to eight routes may be programmed). Listen to more than 100,000 radio stations and 2 million podcasts from around the world, searchable by location, genre, station type, station name and even station call sign. The mbrace information above only pertains to 2016 Mercedes-Benz models and newer. Mercedes-Benz mbrace services are provided by Verizon Telematics Inc. on behalf of Mercedes-Benz and are subject to the mbrace Terms of Service which can be found on www.MBUSA.com/mbrace or by calling 877-570-0367. mbrace is compatible with select Apple iPhone® models running iOS 4.2 or later, and Android-based phones running OS 2.1 or later.